You won't see any of the new models fly until 2022. Paul Allen's Stratolaunch is only just starting to make serious progress on its massive aircraft, but it's already thinking about its future beyond that enormous machine. The company has unveiled a new family of launch vehicles that can carry a wide range of payloads to orbit. Most notably, it's in the "design study" phase for a completely reusable space plane (shown at far right). Stratolaunch won't even predict when the machine would be ready, but it would initially focus on cargo launches and carry crew in later revisions. The firm also has two medium launch vehicles (MLVs) in progress. The regular MLV would carry just under 7,500lbs to orbit and would have its first flight in 2022, while a Heavy variant with three cores is in "early development" and would transport over 13,200lbs. None of the MLVs are about to make SpaceX developers break out in a cold sweat. A Falcon 9 rocket can carry 12,100lbs to a geosynchronous transfer orbit even when the first stage is meant to land. 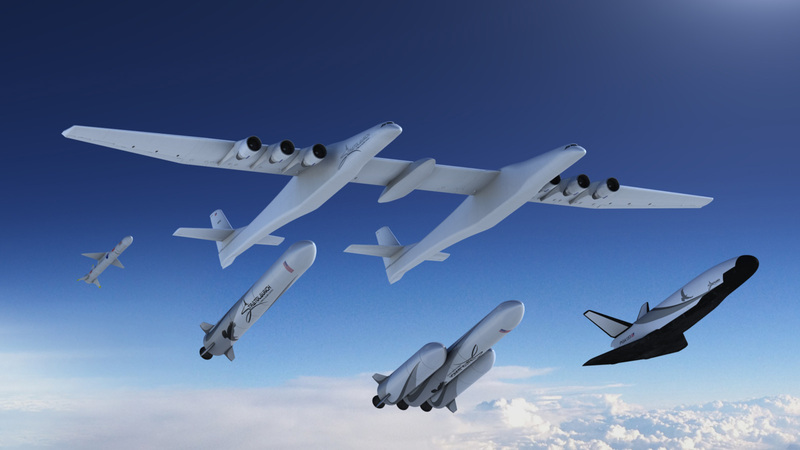 That's not what Stratolaunch is really aiming for, though. Rather, this is meant to both lower the costs of ferrying payloads and improve flexibility. While it might take years for all of these announced vehicles to enter service, it could be worthwhile if it makes space more accessible.